Our youngest congregants are introduced to the festive nature of Shabbat at this special service where story telling, singing and child participation are the focus. This short service is geared to children 8 years of age and younger. 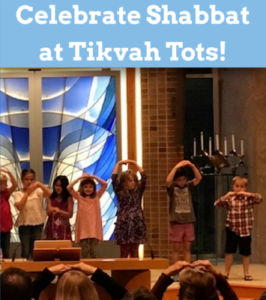 Tikvah Tots services are held on selected Friday evenings prior to Shabbat Services. Attendees can enjoy a Shabbat story with Rabbi Rick and an arts & crafts project with Director of Education Morissa Freiberg. Check the calendar for upcoming Tikvah Tots service dates and times.